The Sunday morning adult Bible study class is starting a new Bible study on June 19, 2016. Each week Pastor Bramwell will lead us through one or more of the lectionary readings for that given Sunday, allowing us to dig deeper into the Word of God that’s proclaimed in the Divine Service. What does this mean? Well, have you ever wanted to start attending Bible study, but were reluctant because the class was halfway through a particular study? Now you can jump right in, knowing each week is a new study. You won’t be left feeling lost because you missed the previous weeks. With that said, though each week is what you might consider a stand alone study, because it follows the church calendar it is connected to the rhythm of worship life, fitting into the season, therefore connecting you to a larger understanding of God’s Word as a whole. If you have to miss a week, well, we’ll miss you, but you can rest assured that you can jump right back into Bible study next Sunday when you return. Pretty cool, yeah? Since Bible study is before the Divine Service, by following the lectionary readings you’ll also be equipped to get more out of worship. You’ll hear the Scripture readings with a fresh understanding as to what the text is about and you’ll discover you’ll have ears to receive the rest of the service in a richer way as well. Blessings in the name of Christ. See you Sunday! Are you looking for information about next year, you know, tuition and fees, an enrollment form, and even next year’s calendar? The PDFs have all been added to the Information page under the School tab, but for your convenience we thought we’d blog it out, collecting all that information into a single post. Just click the links above for what you need… and… boom! The full Gospel reading was Luke 9:28-36. The other readings for the day were from Deuteronomy 34:1-12 and Hebrews 3:1-6. Visit our sermon archive to listen to more sermons. Here are a couple devotional resources for you this lenten season. Each of these is available at the church if you’d prefer to pick up a hard copy there. However, if you’d like to just download your own, here you go. Higher Things Reflections: Lent & Holy Week, 2016. This is a devotional booklet to help you focus on God’s Word during the season of Lent. The link will take you to where you can download a printable PDF or get it in another format if you’d prefer. So, if you have a certain way you’d like to view this great resource (like on a mobile device) you can get the proper format to do so. Another great resource for you during Lent is provided by the LCMS. Here’s the link: LCMS-Table-Devotions-for-Lent. This devotion is meant to be used around the family table. Printing off a copy for each person at the table will make it handy for everyone to participate. May God bless you richly this lenten season. Pastor Bramwell delivered this sermon on January 31, 2016 (The Fourth Sunday in Advent). The sermon text is the Gospel reading Luke 4:31-44. Then [Jesus] went down to Capernaum, a town in Galilee, and on the Sabbath he taught the people. They were amazed at his teaching, because his words had authority. In the synagogue there was a man possessed by a demon, an impure spirit. He cried out at the top of his voice, “Go away! What do you want with us, Jesus of Nazareth?Have you come to destroy us? I know who you are—the Holy One of God!” “Be quiet!” Jesus said sternly. “Come out of him!” Then the demon threw the man down before them all and came out without injuring him. All the people were amazed and said to each other, “What words these are! With authority and power he gives orders to impure spirits and they come out!” And the news about him spread throughout the surrounding area. Jesus left the synagogue and went to the home of Simon. Now Simon’s mother-in-law was suffering from a high fever, and they asked Jesus to help her. 39 So he bent over her and rebuked the fever, and it left her. She got up at once and began to wait on them. At sunset, the people brought to Jesus all who had various kinds of sickness, and laying his hands on each one, he healed them. Moreover, demons came out of many people, shouting, “You are the Son of God!” But he rebuked them and would not allow them to speak, because they knew he was the Messiah. At daybreak, Jesus went out to a solitary place. The people were looking for him and when they came to where he was, they tried to keep him from leaving them. But he said, “I must proclaim the good news of the kingdom of God to the other towns also, because that is why I was sent.” And he kept on preaching in the synagogues of Judea. The other readings for the day were from Jeremiah 1:4–10 and 1 Corinthians 12:31b—13:13. Today is Music Day at Christ Lutheran School. It’s National Lutheran Schools Week and every day this week has had a theme. I embraced the theme today and during Theology Class I used a cover of Johnny Cash’s Man in Black to talk briefly about why pastors typically where black clerical shirts, what the uniform is all about. The kids got the live version, but back before I received the call to serve at CLCS I recorded a version of the song they heard. Here it is, for you listening pleasure, or displeasure as the case may be. Pastor Bramwell delivered this sermon on December 13, 2015 (The Third Sunday in Advent). The sermon text is from the Gospel reading Luke 7:18-28, specifically verses 18-23. The other readings for the day were from Philippians 4:4-7and Zeph. 3:14–20. Why Do We Light the Candles on the Advent Wreath? Why do we light the candles on the Advent wreath? … Because lighting Pastor’s fingers on fire is only fun in Photoshop. But seriously, what’s the Advent wreath all about? What’s with the blue (or purple) and pink (rose) colored candles… and that big white one in the middle? Why is this piece of sanctuary furniture only brought out of the closet once a year? To get answers let’s first turn to a pastor who wrote the book on ceremony and celebration (why and how the church — at least the Lutheran Church Missouri Synod — does what it does). Okay, maybe it’s not the book, but really, Rev. Paul H.D. Lang wrote his extremely informative book, Ceremony and Celebration, with the hope and prayer that it “may contribute something to that phase of Lutheran liturgy which is concerned about its ceremonies” in order that it may “help promote the welfare of the church and the worship of God in and by the church, especially the Lutheran Church.” (Ceremony and Celebration. Preface. iii) In other words, so others, like us, could learn about things like the Advent wreath. “The lighting of an Advent wreath during Advent Season is a Christian ceremony which has come down to us from about the time of Martin Luther. As before the birth of Christ the light of prophecy concerning His advent and his redemptive work became brighter and brighter, so the nearer we come in the church year to the feast of His Nativity the greater the amount of light from the Advent wreath. This ceremony is helpful for recalling, discussing, and teaching the significance of Advent. Think of the wreath like a candle clock, kind of like a birthday cake. The closer we get to Christmas the brighter the light gets! The older grandma gets, the brighter and more dangerous the candles become on her birthday cake. An Advent wreath can be made by tying evergreen branches to a metal or wooden hoop, thus making a wreath. Or purchased at Wal-Mart, Target, or any other fine wreath retailer in your area. He goes on to speak about the lighting of the candles, lighting one and then two and then three and then four with each passing week of Advent. What Rev. Lang doesn’t mention is the specific colors of the candles. It used to be the common practice to have all white candles on the wreath. By the beginning of the 20th century, however, the tradition of the Advent wreath included three purple candles and one pink (rose) one. But, wait. I’m used to seeing the wreath with blue candles, not purple. That can be the case. The purple/blue candles match the color of the paraments in your church. If your church wears the color blue during Advent, like Christ Lutheran does, then odds are your wreath has blue candles. Purple is the color of royalty. It was the most expensive color to create back in the day — no, not when you were a kid — in Biblical times. Liturgically speaking, purple represents penitence and self-discipline. Blue, in the church, is the color of hope and anticipation. An argument can be made for the use of either color during the season of Advent. That’s a blog post for another day. 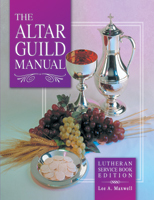 The Altar Guild Manual, by Lee A. Maxwell states that the reason we don’t typically see all white candles on the wreath anymore is because “ecclesiastical supply houses have promoted the custom of using colored candles” instead of white ones. These same supply houses also promote “the use of the Christ Candle” which is in the center of many wreaths, like the one pictured above, but wasn’t part of original Advent wreaths. Traditionally, the use of the Christ Candle is discouraged because the Advent wreath was removed from the chancel or nave on Christmas. There was no need for it because it was just a take on the paschal candle (the big white candle by the baptismal font) that’s already in the church. Today we see a lot of Christ Candles in the center of Advent wreaths. Those wreaths typically remain in the church for the duration of the twelve days of Christmas. So we know what the purple/blue is all about, what those colors represent. What about the pink (rose) candle? Pink (rose) is used to represent rejoicing, which is the theme of the Third Sunday in Advent. No, the acolyte isn’t messing up when he lights the pink (rose) one on the third Sunday. That’s what’s supposed to happen. It’s the week where we read Philippians 4:4, “Rejoice in the Lord always; again I will say rejoice.” It’s a week set apart, especially if you use the purple theme of Advent, with a distinctly different, yet similarly couched focus. For a great article about all the rejoicing going on on Gaudete Sunday, the Third Sunday in Advent, and how it stands out from the rest of Advent, check out this article by Rev. Roberto Rojas Jr. There are a bunch of traditions surrounding the Advent wreath. If you have a certain custom that you practice with your family I’d love to hear about it, just pull me aside at church or give me a call. In the mean time may our Lord bless you this Advent season! The other readings for the day were from Philippians 1:2-11 and Luke 3:1-20. To know more about the news articles that Pastor referenced in the sermon read Mollie Hemingway’s excellent article by clicking here. We’re certainly praying (Kyrie Eleison) for all those whose lives were impacted by the shooting in San Bernardino last week.